Enter Melissa Cresp. Melissa has been an integral part of my workshops this year and I have really appreciated her constant willingness to be there. This time though she went above and beyond, spending her Friday night adapting an old wedding dress she had into something that could be used for the workshop. She also then made herself available for the entire Saturday afternoon. In the end I could not get a male counterpart to play the groom but Melissa worked hard enough for two people anyway. Thanks Melissa. Very much appreciated! 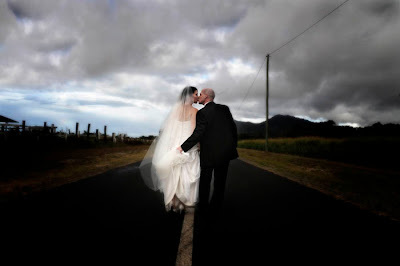 Some time ago, Mark emailed me asking me if I would come to Cairns to photograph his wedding to Melanie. What can I say? No? Never! I love a good wedding and the chance to see Cairns was one I could not turn down. So, I flew up and stayed with Ingrid and Terry at their B&B called Nutmeg Grove. I know Ingrid as a result of her membership to my photography tutorials website, The Five Minute Photographer. 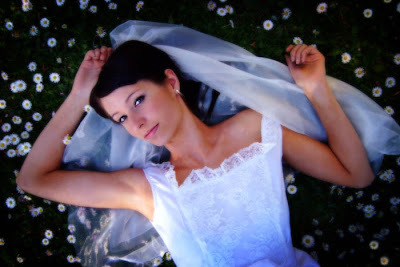 She offered to also be my assistant on the day which made the whole thing even more enjoyable. 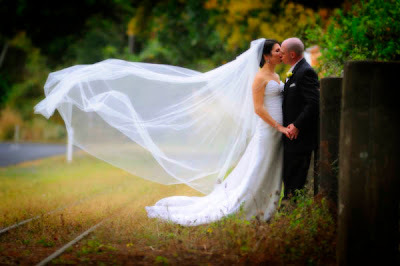 Mark and Melanie's wedding took place on a humid Sunday - the kind of weather we are not used to in Melbourne. I must admit to having sweated from start to finish. But I am very happy with the resulting images, and I am even happier to have made new friends in Ingrid and Terry and Mark and Melanie. It is always an honour to be entrusted with a wedding. It is an even greater honour to have been given it from so far away. Thanks Mark and Melanie, and Congratulations! Keeping the White balance consistent in a series of images can be difficult. Usually I begin each shoot by settin gthe White Balance manually according to the most approproate setting. Then I take a picture of the 18% grey side of my Lastolite EzyBalance and using the eyedropper tool in Lightroom I synchronise all the images to match that. Yesterday, however, I found myself in a situation that completely bamboozled me. 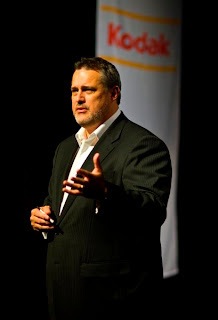 I was photographing a seminar in which Kodak Vice President, Jeff Hayzlett, was speaking. When you are working for the 'Big Yellow Box' you make sure to get the colours right! But! No matter what white balance setting I used, the colour was wrong and Auto White balance would not have kept the images consistent. In the end, through trial and error, I set the camera's white balance numerically to 2500 Kelvin and Voila! It worked! Even when I got around to processing the shoot in Lightroom I found that nothing needed to be done. Jeff saw some of the images on the back of the camera and was very pleased. He says he wants to use one of them himself. Look out for it on his Facebook site!